In one of the communications classes that I teach in college, I predicted Thursday that there would be a backlash against National Public Radio for firing news analyst Juan Williams (see right) for comments he made about Muslims on Fox News on Monday. Host Matt Lauer steered the conversation toward the difficulty of a journalist like Williams offering opinions for one news organization (Fox News) while being told to avoid controversy while working for another one (NPR). It is a tough act to pull off, but these days it isn’t uncommon and it isn’t like it was something news for Williams. I wouldn’t have fired the guy. After all, he made the comments Monday and most of the TV world didn’t seem to realize it until three days later when he was fired. That suggests the comments weren’t that controversial. I might have suspended him or put him on double secret probation for telling Bill O’Reilly on Fox he gets nervous at airports when he sees people in Muslim garb. It was a stupid, insensitive comment on multiple levels. First, Williams had to realize making such politically-incorrect, stereotypical statements about religion or ethnic heritage recently cost broadcaster Rick Sanchez and Helen Thomas their jobs. It’s just stupid to go there, especially in this climate. Secondly, anyone who has watched an episode of Fox’s “24” or any other entertainment series dealing with terrorism realizes that one shouldn’t worry about the people openly and proudly dressed as Muslims. That’s basically asking security — which is guilty of profiling – to pay attention. The terrorists in the entertainment shows – and more likely in real life — are the ones hiding or disguising their identities to avoid suspicion. Thirdly, the conservative Williams had to realize that NPR – which has a very liberal image – might have been looking for a reason to fire him if he just gave them cause. It was just as easy to predict that Republicans would pounce on Williams’ firing as an example of NPR’s liberal leaning and threaten to pull funding. The political right has NPR over the barrel on this one. No media outlet – liberal or conservative — wants to look like it is suppressing free speech and practicing censorship. It might have gotten away with a suspension, but not a firing. Some of the blame should go to O’Reilly, who got in hot water a week earlier making some stereotypical, politically-incorrect comments about Muslims on ABC’s “The View” that led to regulars Whoopi Goldberg (who defended Williams Thursday) and Joy Behar to initially walk off the set of their own show. O’Reilly essentially was asking Williams to fight his battle, which led to the analyst to shoot himself in the foot. O’Reilly could have helped save Williams by telling him how easily his comments could be misinterpreted and asking him if he wanted to re-phrase them. Williams later tried to put the comments in better context. I’m getting more than a little nervous about how quickly news organizations are to fire people when suspensions and some sensitivity training might be the proper punishment. * Now on to another lighter controversy involving a Fox program: “Glee,” the high school musical series that on a weekly basis teaches the lesson that is important for people to be themselves. Cast members Lea Michele (Rachel), Dianna Agron (Quinn) and Cory Monteith (Finn) did a magazine photo shoot in which they appear in racy poses that adults would hope high school students and fans of “Glee” would avoid. Everyone laughed. But the comment does illustrate the disconnect between kids and parents, as well as Fox News and Fox entertainment. Many adults may be appalled by the pictures of the stars in their underwear, but kids in their teens and 20s will tell them that ordinary young adults put much worse on Facebook or one of the other social networks. I’d also guess that some conservative Fox News commentators (now that’s a phrase that is redundant) would be appalled. However, Fox entertainment executives probably are privately gleeful that the controversy will improve the show’s strong ratings. Fox News may be a conservative’s dream. But some of Fox’s prime time shows – especially the animated ones — are a conservative’s nightmare. I don’t completely understand how his firing can be construed as a suppression of free speech. Mr. Williams is free to say whatever he wants, but he can’t spout racist crap while a employee of NPR. And while the Right is all up in arms about this, their programming would drop any of their non cash cow employee if all of a sudden they started vocally supporting reproductive rights or marriage equality. 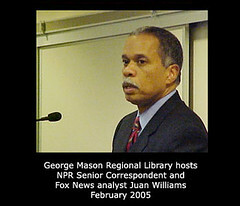 Honestly, I support NPR’s decision and if Williams finds a place on Fox News then good for him. Alan, did you pay attention to the entire Juan Williams segmet? He said he was suspicious of Muslims on planes, etc., but he also said that this was wrong and it’s something we need to guard against. He wasn’t be politically incorrect. He was making a nuanced statement. Obviously one that you completely missed (or chose to ignore). I do not agree that NPR is “very Liberal”, on the contrary… they are quite middle of the road and do not stray far from establishment views. First, NPR said there have been multiple instances of him doing this, putting out his position on strong issues threatening his credibility as an unbiased analyst. Second, I’m amazed that you suggest anyone should care about republicans making noise. It’s time for you media people to grow a pair and stad up for ethics and honesty and professionalism rather than republican pressure. Third, he has the same rights of speaach as any citizen. That does not mean NPR can’t say we’re not going to pay you. NPR has the right to decide who it hires and what standars it imposes. Just like FoX Spews has a right to hire who it wants and not have objective standards and practises. Usually enjoy your commentary – but you missed a key point on this one – Sanchez and the ridiculous Helen Thomas both made strongly negative COMMENTS about one nationality. Williams (who is a professed liberal) commented that even HE, a liberal, had nervous feelings because of what happened on 9/11. He built on that to explain that the feelings were not rational AND that they should NOT be an indictment of a religious group or race. Too bad you could not bring yourself to view FNC to see the original comments before you chastised Mr. Williams. I’m a blogger average joe and I observed your article to get extremely fascinating and distinct. Great job for this article, and I’ve just became subscribed for that blog. Hope you do the very same for me.